NOW HERE IS THE PLAYLIST SO YOU CAN KEEP TRACK! The Cliff Divers - Meet The Cliff Divers! NEVER FORGET THAT THE SURFPHONY IS ON ITUNES! SO EASY TO SUBSCRIBE!! CLICK THE LINK OR JUST CLICK THE PIC! ONE MORE THING... TONIGHT, FEBRUARY 27th, I'M DOIN THE THING I DO EVERY FEBRUARY AND THAT WOULD BE DROPPING IN ON DAVE KONSTANTINO'S ANNUAL SURF GIG, REVOLUTION SURF ON CJAM 99.1 FM! IT'S THE TENTH ANNIVERSARY AND WE'RE PUTTING A LOT OF SURF TOGETHER TO CELEBRATE THIS OCCASION! CARLEY OF EVERYTHING'S NO GOOD IS THROWING DOWN TOO AND YA BEST BELIEVE SHE KNOWS WHAT'S BEST FOR THE SURF BUSINESS! IT'S GONNA BE A PARTY BABY! REVOLUTION SURF X WILL BE ON CJAM 99.1 FM AT 7PM EASTERN IN WINDSOR AND DETROIT AND ALL OVER THE WORLD AT CJAM.CA! JUST CLICK THE PIC SEEMS THAT'S ALL THERE IS TO DO! WELL MERRY CHRISTMAS OR HAPPY HOLIDAYS OR WHATEVER I DON'T REALLY CARE FINKS. WHATEVER FLOATS YER BOAT. I KNOW WHAT FLOATS MINE AND THAT'S A SOLID PIECE OF FOAM CAUSE IT'S NOT A BOAT IT'S A DANG OL SURFBOARD! HANGIN TEN IN THE MOST STYLISH MANNER, TAKE A LOOK CAUSE IT'S DERK BRIGANTE DOIN' WHAT I DO BEST AND DAMN IF I GOTTA EXPLAIN IT TO YOU AGAIN! GEEZE. OH YES ANOTHER FINE EPISODE OF GREAT SURF AND WHATEVER ELSE I GOT UP MY SLEEVE. MAYBE I'LL GIVE YA A HINT... THE CLIFF DIVERS, THE TORNADOS, LONGBOARDs, THE MIGHTY SWELLS, AND MR GASSER AND THE WEIRDOS! THAT'S ONLY A BRIEF TASTE OF WHAT I GOT IN STORE! BETTER SIT DOWN AND WRITE OFF THE NEXT 60 MINUTES OF YER LIFE CAUSE THE SURFPHONY IS ABOUT TO GET WIIIIIIIIIILD! I JUST... I JUST CAN'T SIT DOOOOWN!! The Gallants - The Man From U.N.C.L.E. IT'S ANOTHER FULL MOON AND IT'S ANOTHER EPISODE OF THE BEST SURF PODCAST AROUND, IT'S THE SURFPHONY OF DERSTRUCTION 2000 FOR THE 36TH TIME NOW CAN YOU DIG IT?! LOTS OF SURF FROM ALL OVER THE WORLD ON THIS EPISODE! WE HAVE RUSSIA, SPAIN, CANADA, USA, JAPAN! YOU NAME IT WE GOT IT! BANDS LIKE KING BEEZ, THE PANTERAS, THE SILICON, AL CASEY, THE GNARLY ONES! YEH WE GOT EM TOO! I KNOW YOU LIKE EM SO JUST GET TUNED IN AND GET TO LISTENING!! 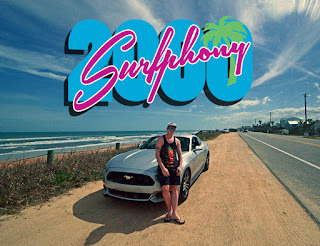 YOU CAN ALSO GET THE SURFPHONY ON ITUNES! IT'S JUST THAT SIMPLE... CLICK HERE! BIG NEWS ON THE BIG SURF! THE DEBUT OF LUAU OR DIE'S NEW ALBUM, DEAD ON THE FLOOR VOLUME 2! BETTER LISTEN IN TO CATCH THE NEW TRACKS FROM THE SURFER SPIES INCLUDING A WICKED EXCLUSIVE SONG ONLY ON THE SURFPHONY OF DERSTRUCTION 2000! OF COURSE I GOT A FEW MORE SURF TRAX FOR YA, LIL BIT OF CANADIAN SURF AND EVEN SOME SPOOKY TUNES TO GET YA IN THE MOOD FOR THE SURFPHONY OF DERSTRUCTION ... BOOOOOOOOO THOUSAND! COUNT VON DERKULA IS TAKING OVER THE BIG SURF FOR OCTOBER SO YA BETTER BE READY FOR ONE HELLUVA HALLOWEEN HOOTENANNY! GET READY AND GET SET FOR A GOOD TIME! WELL ALRIGHT! THE BIG SURF IS BACK IN A BIG WAY AND IT AIN'T IN POG FORM! NOPE CAUSE THE SURFPHONY OF DERSTRUCTION TWO.... THOOOOOOOOOUSAND IS BACK IN BUSINESS AND BACK TO BASICS! NO WACKY TIME TRAVEL SHENANIGANS NO DUELING DERKS, JUST THE BIG DERBOSKI AND THE SURF MUSIC YOU'VE BEEN CHOMPING AT THE BIT FOR SINCE THE LAST FULL MOON! IT LOOKS LIKE THERE IS A FULL MOON TONIGHT SO THAT MEANS THAT WE HAVE COME ASHORE ONCE AGAIN FOR ANOTHER 6 MINUTES OF SURF FROM AROUND THE EARTH AND BOY ARE YOU IN FOR A TREAT THIS EPISODE! SOMEHOW I ENDED UP PUTTING A BUNCH OF COVER SONGS AND I DIDN'T NOTICE FOR A GOOD WHILE... BUT THEN I DID NOTICE! I THOUGHT IT WAS PRETTY COOL! MAYBE YOU WILL THINK THE SAME! MAY AS WELL TUNE IN AND FIND OUT WHAT I GOT UP MY WHITE TEE SLEEVE! Pinball Extraordinaire! Purveyor of Surf around the Earth! RSS Feed for the Surfphony of Derstruction 2000!